Product prices and availability are accurate as of 2019-04-24 08:09:04 UTC and are subject to change. Any price and availability information displayed on http://www.amazon.co.uk/ at the time of purchase will apply to the purchase of this product. As Dr. Dressler writes in this article, cooked, white Quinoa can be used, in some cases, as a substitute for steel-cut oats or brown rice in the Dog Cancer Diet. He writes that he doesn't recommend feeding quinoa to dogs that are in good condition or actively struggling with cancer cachexia. Don’t choose quinoa if your dog doesn’t want to eat. But if your dog is obese or overweight, it might be helpful. If your dog has oxalate kidney stones, he recommends that you should certainly avoid quinoa. If you would like to use quinoa as your carbohydrate source, use white quinoa and then take the amount of oatmeal in the Dog Cancer Diet recipe and multiply it 3.5 times. Quinoa (pronounced "Keen-Wah"), is an Andean plant, originating in the area surrounding Lake Titicaca in Peru and Bolivia, where it is believed to have been cultivated for the last 7000 years. During the age of the Incan empire. Quinoa grown in Bolivia is known as 'Royal Quinoa', and is considered to be the highest quality of Quinoa in the world. The result is a larger, rounder seed that tastes nuttier and fluffier once cooked than any other variety, and boasts a more nutritious dietary profile. Similar to Amaranth, Quinoa is known as a pseudo-cereal, and is prepared and eaten in a similar manner to a grain. Our Quinoa is grown in Bolivia at an altitude of approximately 12,000 feet above sea level, in an area surrounding the 'Salar de Uyuni' - the dry, arid salt flats of the Bolivian Antiplano. This region has extremely harsh weather conditions, coupled with intense seasonality, which as a result makes Quinoa incredibly durable. The Quinoa Seeds are carefully harvested by local farmers, and cleaned and sorted in the local production facility. After thorough testing, our Quinoa then makes its way to be packed in the UK, before being sent out to our awaiting customers. Why buy from Sevenhills Wholefoods? 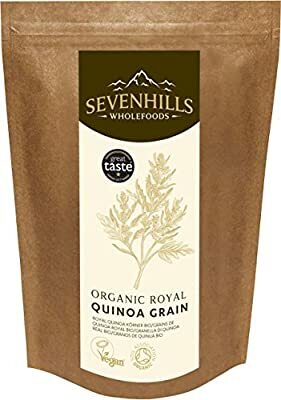 Sevenhills Wholefoods only sells superfoods of the highest quality. We source directly from producers, so we're always in touch with where our products are grown and processed. Our direct supply line and online-only availability, mean that our customers benefit from the best possible prices. We like to think of ourself as a virtual farmer's market for superfoods, a no-frills way of buying great foods at the best prices.